To view this alert via the web, click here. ♦ Approximately 2,000 abstracts expected! Over 450 first-author members receive AAI travel awards each year! ♦ Hear the most distinguished immunologists in the field! ♦ Guest societies from around the world participate and feature specialized immunology topic areas! ♦ Exciting 2019 Gala aboard the USS Midway aircraft carrier and museum featuring live music, dancing, and interactive displays! ♦ An Exhibit Hall with hundreds of exhibits and products on display! 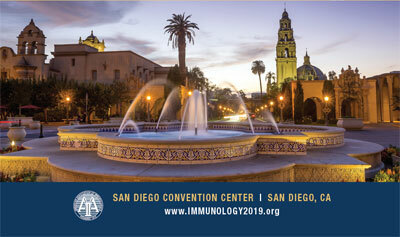 ♦ Look for the Call for Abstracts / Preliminary Program coming soon to www.immunology2019.org! eligible for awards and to save on registration and abstract fees! © 2018 The American Association of Immunologists, Inc. If you are no longer interested in receiving email alerts, click here. Please note: AAI e-mail alerts are issued strictly for the purpose of advancing the interests of AAI members and the immunology research community they serve. Alerts are directed to AAI members and to others who attend AAI meetings or courses, otherwise participate in AAI activities, or utilize AAI programs or services (including those of The Journal of Immunology and ImmunoHorizons). AAI does not sell or otherwise provide its list of alert recipients to any third party for any purpose.